For historical reference purposes only. All Bias Tee models have been discontinued. 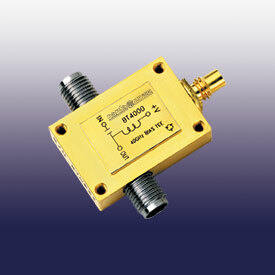 L3 Narda-MITEQ manufactures and designs high performance Microwave Bias Tees that operate from 30 kHz to 40 GHz. These Bias Tee products feature: ultra-broadband performance, low insertion losses, off-the-shelf delivery and compact designs. L3 Narda-MITEQ's Bias Tees are suitable for 40 GB systems and typical Bias Tee applications include: OC768 transmitters and receivers, general purpose test and measurement systems. Some bias tee options are available such as custom frequency bandwidths and different connector outputs. Biasing for photodiodes (vacuum and solid state), Microchannel plate detectors, transistors, and triodes. High frequencies are not leaking into a common power supply rail and noise from the power supply does not appear on the signal line. A bias tee is a kind of multiplexer which has 3 ports arranged in the shape of a T and where high frequencies (generally above 1 MHz) pass horizontally through the T and lower frequencies take a 90 degree turn used to bias transistors and diodes. It is a simple composition of one capacitor and one coil with attention paid to the details. 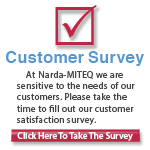 L3 Narda-MITEQ can offer customized bias tee solutions that meet your specific requirements. Our Component are backed by L3 Narda-MITEQ's 3-Year Warranty, and most are available as RoHs Compliant components.